The Elizabeth F. Flower papers were donated to the University Archives in 2006, 2007 and 2009. This collection has been organized alphabetically by series, except for the Audio tapes series, which is attached to the end. Folders within each series are arranged alphabetically. Elizabeth Farquhar Flower was born in Atlantic City, New Jersey in 1914. She graduated from Wilson College in central Pennsylvania with a degree in chemistry in 1935. When she first came to the University of Pennsylvania, she was interested in medicine. Later, through attendance at an unusual seminar in the philosophy of science conducted by Professor of Philosophy Edgar A. Singer, she developed an interest in ethics, especially in its relation to psychology, social science, law and education. She obtained from Penn her Ph.D. in philosophy in 1939. Flower began her teaching career at Penn in 1937 when she was appointed as an assistant instructor. She was appointed Assistant Professor of Philosophy in 1947, obtained tenure in 1956 and was promoted to full professor in 1974. Although most of her academic life was associated with Penn, Flower also taught or lectured at Columbia (Barnard), Hamilton College, and Latin American universities in Peru, Colombia, Chile and Argentina. Among her multitude of students, many of whom became college faculty around the country, was Dr. Martin Luther King, Jr. King audited Flower’s course on ethics and the history of philosophy while he was enrolled at Crozer Theological Seminary in 1949. Fifteen years later, King met Flower again during a one-day seminar. Flower also engaged in various forms of philosophical practice. During WWII, she developed a substantive interest in the study of Latin America. She worked with the American Friends Service Committee in Mexico, with work camps, with the exiled Spanish Republican intellectuals, especially the philosophers, and with the Indian and Education departments. Flower published many articles in philosophical journals. She was best known, however, for the two-volume History of Philosophy in America (1977), which she co-authored with Murray Murphey, a faculty member in the Department of American Civilization at Penn. She co-wrote another major work, Critique of Applied Ethics: Reflections and Recommendations (1994), with Finbarr O’Connor of Beaver College and her husband Abraham Edel, another well-known professor of philosophy. In relation to the publication of the two major works mentioned above, Flower did extensive research in Scottish philosophy; the St. Louis Hegelians; William James, founder of American psychology (1842-1910) with his authoritative work Principles of Psychology; and John Dewey (1859-1952), an educational reformer and founder of the philosophy of pragmatism and of functional psychology. As a former head of the Penn Department of Philosophy put it, Flower carried on the pragmatist school of philosophy in the United States. This collection documents the life and teaching and research career of Elizabeth F. Flower as an academician and faculty member in the field of philosophy. 1. American Section of the International Association for Philosophy of Law and Social Philosophy, General files, Greater Philadelphia Philosophy Consortium, and Meeting file. These four series include material related to various academic, professional, social, regional or publishing activities Flower engaged in. 2. Associate/Subject files. This series includes files related to her colleagues and other professional associates or material of specific subjects related to her research. 3. Clippings. Apart from a small number of newspaper clippings, the bulk of the series consists of material related to work done by miscellaneous authors in philosophy, history of philosophy, psychology, law, anthropology, and other fields of social sciences. 4. Correspondence and Personal are two small series. They include correspondence of both personal and professional interests, curriculum vitae and biographical and bibliographical material of Flower, as well as such personal items as passports, miscellaneous IDs, diplomas, and wills. 5. Drafts and notes. This is the bulkiest series of the collection. Most files contain incomplete drafts or notes of ongoing research/study projects, either for publication purposes or to be used as notes in teaching. Judging from the topics covered in these files, most material in this series is in preparation of the two major published works authored by Flower with others, namely, History of Philosophy in America and Critique of Applied Ethics: Reflections and Recommendations. This series shows the sweep of Flower’s philosophical interest, which ranged from the study of European modern philosophy pioneering thinkers such as Thomas Hobbes, John Locke, David Hume, Immanuel Kant, Georg Wilhelm Friedrich Hegel; the study of the Scottish school of common sense philosophy represented by Thomas Reid and its impact in Pennsylvania and New Jersey (Princeton University); to the study of modern American philosophers John Dewey, George Santayana, Clarence Irving Lewis, and the influence of St. Louis Hegelians (represented by William T. Harris) in American education. This series also documents Flower’s interest in other branches of social sciences, as seen in notes related to William James and his monumental work Principles of Psychology, Darwin, Spencer, etc. A sub-group of this series is entirely focused on the study of Dewey and his thinking on ethics, pragmatism, valuation, etc.6.Latin America and Mexican studies are two small series that recorded Flower’s interest in the study of philosophy and anthropology in Mexico and other parts of Latin America. It concentrates over a period from wartime in the early 1940s to early 1960s. 7. 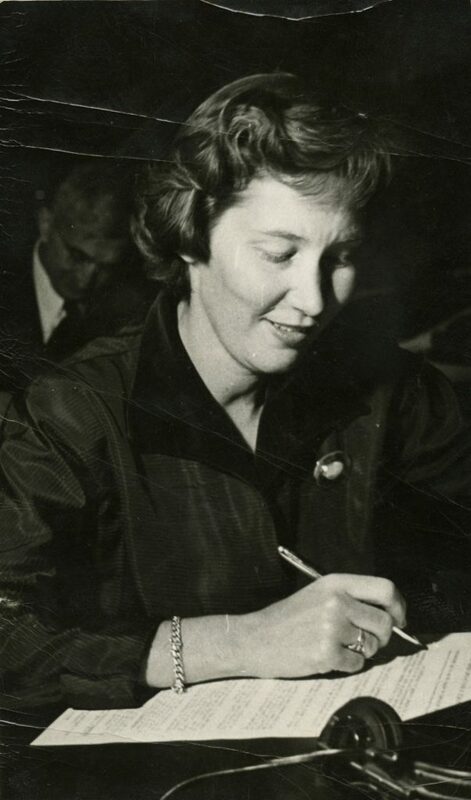 “Papers and manuscripts” and Publications are two series that include individual pieces of writing and published articles by Flower, or in some cases, done with her husband Edel, and occasionally, by Edel alone. 8. Student papers. This small series reflects some of the course work in Flower’s teaching. 9. Photographs and Audio tapes. The Photographs series include portraits, and personal, family or group snapshots. The Audio tapes series is a voluminous collection. The tapes record academic, research and social activities Flower and Edel engaged in, some related to their publications. Most tapes bear only very sketchy notes of content. International Association for Philosophy of Law and Social Philosophy. American Section. Paper by Bayles, Michael D.
Paper by Clark, Lorenne M. G.
Paper by Nagan, Winston P.
Baylis, C. A., Cognitive functions of ethical utterances, n.d.
Bondy, Augusto Salazar, correspondence, 1959-1960, re his intended visit to U.S.
Brandt, R. B., “Rational decisions: personal and social,” n.d.
Carlson, John G., and Elaine Hatfield, Psychology of Emotion, chapters, n.d.
Diamond, Cora, “Losing your concepts,” n.d.
Hicks, Steven V., “Persons and international law in Hegel,” n.d.
Kaufmann, Walter, “Doubts about justice,” n.d.
Kohlberg, Lawrence, article “The child as a moral philosopher” and the paper “A response to ‘educational theory and inspiration’,” n.d.
Luizzi, Vincent, “A naturalistic theory of justice – a critique of C.I. Lewis’ ethical theory,” n.d.
Margolis, Joseph, “Thinking, according to Praxism” and “Racial classification and compensatory justice,” n.d.
Outline of a book project, with typescript of the Conclusion part, n.d.
Rice, Daniel F., book manuscript, Reinhold Niebuhr and John Dewey, n.d.
Riedl, John O., “Pantheism and its consequences,” 1971 Nov.
“Preliminary studies in rules and behavior,” n.d.
Shapere, Dudley, objectivity, rationality, and scientific change, n.d.
Stegmüller, Wolfgang, “Explanation, prediction, scientific systematization and non-explanatory information,” n.d.
Stenson, Sten H., book manuscript on Scottish empiricism, n.d.
Tinsman, James H., “Psychology and Epistemology,” n.d.
Witt, Charlotte, “Actual priorities: the priority of actuality in Aristotle,” n.d.
Wolin, Sheldon S., “Political theory and political paradigm,” n.d.
Daily Pennsylvanian, 1965 Feb. 10, etc. “A preliminary outline for the cross-cultural study of ideologies,” prepared by A. Leeds, n.d.
“A tale of two pities,” by Ivar Berg, n.d.
“American’s crippled pluralism,” by Ivar Berg, n.d.
“Autonomy in psychotherapy,” by Mady Edelstein, n.d.
“Biology at the University of Pennsylvania,” by D. H. Wenrich, n.d.
“Comments on Hacking’s ‘Michel Foucault’s immature science’,” by Richard Rorty, n.d.
“Contingent scientific realism and instrumentalism,” by Eugene Lashchyk, n.d.
“Coping with conflict” and “Idealism, empiricism and pragmatism,” two papers by Frederic Schick, n.d.
“Current trends in philosophy of science,” by Zoltan Domotor, n.d.
“From cabinet to curriculum: The assimilation of anthropology by Oxford and Cambridge,” authorship unknown, n.d.
“Ideals and essences in Santayana’s philosophy,” reprint by Milton K. Munitz, n.d.
“Moral philosophy and education,” by Henry D. Aikon, and another paper by Joan L. McGregor on Robin Malloy’s classical liberalism critique, n.d.
“On reflexivity in human communication,” by Klaus Krippendorff, n.d.
“Pragmatic philosophy of science and the charge of scientism,” by Peter T. Manicas, n.d.
“Process, structure, and function in Piaget and Dewey’s theory of intelligence and inquiry,” by Mark Mendell, n.d.
“Psychologism and behaviorism,” by Ned Block, n.d.
“Race consciousness and community: the need for a black perspective in civic deliberative discourse,” by Kenneth S. Tollett, 1990 Oct.
“Recent work on the concept of rights,” by Rex Martin and James W. Nickel, 1978 Nov.
“Representation in perception and cognition,” by Gary Hatfield, n.d.
“Rights and duties in regards to the environment…,” by Abraham Edel, n.d.
“The passing of Peirce’s realism,” by Joseph Margolis, n.d.
“The pragmatism of Benjamin Franklin,” by James Campbell, n.,. Albert, Ethel M., “Social science facts and philosophical values,” 1957 Oct.
Four, on ethics and rights, n.d.
Clauss, Carin Ann, “Women and economic inequality,” n.d.
Collection of articles on Peirce and law, manuscript by Roberta Kevelson, et al, with Flower’s comments, n.d.
G.E. Moore and polysemy, a paper with no title page by Gareth B. Matthews, n.d.
Keith-Lucas, Alan, “Social work values and their development,” n.d.
Kovich, Todd, “On choosing a method appropriate to the purpose and the level of analysis,” n.d.
Liacouras, Peter J., “A reply to Carl Cohen,” 1974 Oct.
Paper on contract law and social ethics, by Elbert Robertson, n.d.
Paper re [Dugald] Stewart on mind and body, n.d., with notes re other members of the Scottish philosophy including Hume, Reid, etc. Four, on Dewey, rationality, radical empiricism, etc., n.d.
Two, “Intentionality and rationality,” by Dagfinn Follesdal; “Whatever happened to pragmatism?” by Babbie Schwartz, n.d.
Two, on topics of “Nature and culture” marked by Manicas, n.d.
Two, one by Edmund L. Pincoffs on partiality, n.d.
Schwartz, L., on behavior and psychology, n.d.
Two reviews, one by P.R. Chambellan on Henry W. Johnstone and Roderick Chisholm, one by John W. Sweigart, n.d.
Vickrey, William, “Justice, equality, and the economic system,” n.d.
Wellman, Carl, “Supreme court of Washington v. Carl Cohen,” n.d.
Notes on Murray Murphey, Thomas Hobbes, etc., n.d.
“Current critiques of education,” n.d.
“Deduction, induction, and problematic structure,” n.d.
“The absolute immigrates to America: the St. Louis Hegelians,” n.d.
“The unity of knowledge and purpose in James’ view of action,” etc. Education, etc., with a letter from Edel to Irving Louis Horowitz, 1989 Sept. Practical moral problems, 1989 Nov. Discussion on John Rawls, n.d. Discussion on William James concerning “efferent processes” etc. Moral inquiry and context, n.d.
Freedom of speech, applied ethics, etc., n.d.
Miscellaneous notes including Darwinism, Spencer, etc. Idealism, realism, pragmatism, naturalism, Scottish philosophy, etc., n.d. Interpretation of audio tapes by Abraham Edel on morality, ethics and the “Realistic” theory, n.d.
James Wilson and political ethics, n.d.
Kant, Hegel, Marx, J. S. Mill and utilitarianism, n.d. Moral inquiry, American social philosophy, etc. Moral inquiry, contexts, diagnosis, etc. Perception, conceptualization, common sense, language, labeling, etc. Political philosophy and St. Louis Hegelians, n.d.
Peirce, Dewey, James, Lewis, Mead, etc., n.d.
Stewart (Dugald), Scottish philosophy, John Stuart Mill’s attack on William Hamilton, etc. Outline and chapter summary, chapter 6 – chapter 28, n.d. Tape interpretation, re context in moral judgment, etc. The moral and the social sciences, n.d.
Thomas Davidson, William T. Harris and St. Louis Hegelians, n.d.
William James and his Principles of Psychology, n.d.
William James’ study: motion, emotion, efferent processes, etc. William T. Harris and St. Louis Hegelians, n.d.
“Dewey: dueling against dualisms,” n.d.
Dewey: early life and the evolution of his thinking n.d.
Dewey’s objections to utilitarian theory, etc. Emotion, the reflex-arc and effort, n.d.
Individual/community, public/private relations, diagnostic tools, etc. Morality, psychology, savage mind, n.d.
Quest for certainty and theory of valuation, n.d.
Book proposal, selections of the philosophical writings of Clarence Irving Lewis, with an introduction by Flower, et al. Journal of the History of Ideas, “The alliance between Puritanism and Cartesian logic at Harvard,” submission for review, n.d.
St. Bonaventure University, Patrick K. Dooley, four American philosophy courses, syllabus, n.d. Teaching file, questions and writings on David Hume, including a paper on “Hume and the economists of the 18th century” n.d.
Reference paper “Opportunism and trust in commercial negotiations,” by G. Richard Shell, n.d.
Paper “Realism and the value freedom of science,” by Hugh Lacey, 1988 Sept.
Paper “Scheme-conent dualism, experience, and subjectivity,” by John McDowell, 1989 Nov.
Paper “Terrorism, rights, and political goals,” by Virginia Held, 1988 Nov.
“Philosophic thought in Latin America,” a partial bibliography prepared by Edmundo Lassalle, n.d.
“Philosophy in Peru: An historical survey,” paper by Augusto Salazar Bondy, n.d.
Seminar on Contents and Methods, 1990 Nov. – Dec.
“Philosophical trends in Mexico,” n.d.
History of philosophy in Mexico, with biography of Manuel Gamio, “contributions from the pre-colonial period,” etc. Including “The right wing and catholic action,” “Philosophic trends in Mexico,” material re José Vasconcelos, etc. Notes on Mexico election, n.d.
“An essay on the sublime,” n.d.
“Deduction, induction, and problematic structure,” with Abraham Edel’s version, n.d.
“Experience and legal reasoning,” n.d.
“Induction and social validation,” for the Colloquium on Validation of New forms of Social Organization, 1967 Sept.
“Integrity as a virtue,” n.d.
“Ramblings of thoughts from [Jiddu] Krishnamurti’s discussions,” n.d.
“The absolute emigrates to America,” n.d.
“The practical as a philosophic conception,” n.d.
“The practical as a philosophical conception in American thought,” draft, n.d.
with the paper “Action and value in the philosophy of William James,” n.d.
“Theory of inquiry” and study of Dewey and logic, drafts, n.d.
“Toward a working conception of nationalism,” n.d. Articles, two, “The unity of knowledge and purpose in James’ view of action,” and “Comments on philosophy of science and educational theory,” n.d. Comments on “Presumptive order and definition in ethics,” n.d. Essay by Edel in memory of biographer Leon Edel, n.d.
History of Philosophy in America, preface, introduction, etc. Metaphysical background for value theory, etc., n.d.
Paper (with no title page), a discussion with Mr. Murphy on ethics, n.d.
Two papers: “Induction and social validation,” 1967 Sept.; “A response to ‘educational theory and inspiration,,” n.d.
“Survey of James’s psychology” and “Will: a theory of voluntary action,” n.d.
“The emergence of accounts of purposive behavior,” n.d.
Public School Athletic League of Atlantic City medal n.d.
“Truth, Fate and the Historians,” by Abraham Edel, 1957 Feb.
“C. I. Lewis–conceptualistic pragmatism,” with comments of the instructor [Flower? ], n.d.
Book review by Bernice Goldstein of “La Filosofia en Bolivia” by Guillermo Francovich, n.d.
Doctoral (James L. Celarier) and master’s final (Norman Melchert), n.d. Philosophy 4, two papers by Peggy Deutsch, n.d. Philosophy 507, “The rational imperatives” (re Lewis valuation), by Foster E. Tait, n.d. Philosophy 607, Ethics, paper by Martha S. Hertzberg, n.d. Philosophy 620, term paper “Factual judgment and value judgment,” by Jiichiro Takeo, n.d.
Two, one by Mark Mendell, 1980 Aug., and the other by Jennie Uleman, 1990 Jan.
Eighteen cassette tapes in one shoe-box, “Community, institution, individual” discussion, etc. Eighteen cassette tapes in a shoe box, re Dewey, context, etc. Eighteen in a shoe box, re PARSS [Pennsylvania Association of Rural and Small Schools], etc. Nineteen cassette tapes in a shoebox, some related to the study of [Thomas] Hobbes, some re [Bertrand] Russell, “Decision,” etc.